The 6-mile trail that accesses the popular Rainbow Falls area and the top of Mt. Le Conte has been closed Monday through Thursday to accomplish some much-needed rehabilitation. After two years of work, one of the most popular trails in the Great Smoky Mountains National Park has fully reopened to visitors. 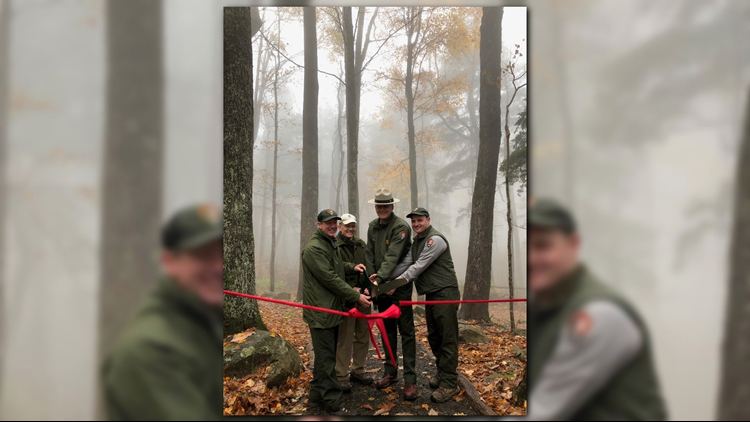 Park officials hosted a ribbon-cutting event Wednesday to thank the work crew, volunteers, park partners, and donors for their support in finishing the rehab project on Rainbow Falls Trail. The 6-mile trail that accesses the popular Rainbow Falls area and the top of Mt. Le Conte had been closed Monday through Thursday to accomplish some much-needed rehabilitation. Crews that were recognized included the National Park Service Trails Crew, the American Conservation Experience Youth Crew, Friends of the Smokies, and the Aslan Foundation. "The much-needed trail improvements enhance the safety of the trail and provide a durable trail corridor to limit visitation impacts on one of the most iconic trail destinations in the park," the park wrote in a release. "Through the thoughtful rehabilitation techniques using natural materials, the historic nature of the trail has been preserved allowing future visitors an opportunity to enjoy the unique trail for years to come." The November 2016 wildfires caused some sections of the trail to erode and high winds damaged the trail tread. "The crew installed over 350 steps through steep, narrow corridors, created nearly 600 feet of elevated trail surfaces, installed nearly 400 drainage elements, and placed over 1,000 native stones along the trail to create a durable, sustainable trail corridor," the park said in a release. In 2019, the Trail Forever crew said it will begin a 2-year rehab project on the Trillium Gap Trail. Other trails including Deep Creek Trail, Rough Fork Trail, Smokemont Trail, and Noah Bud Ogle Trail. "Due to the rehabilitation process on Trillium Gap Trail, a full closure will be necessary for the safety of both the crew and visitors. The Trillium Gap Trail and associated parking areas will be closed May 6, 2019 through Nov. 14, 2019, excluding federal holidays, on Monday mornings at 7 a.m. through Thursday evenings at 5:30 p.m. weekly. The trail will be fully open each week on Friday, Saturday, and Sunday," a release from the park said. In 2012, Friends of the Smokies established the Trails Forever endowment thanks to a matching gift from the Aslan Foundation in Knoxville. Now, the $5 million endowment funds a full-time trail crew in the Great Smoky Mountains National Park to reconstruct and rehabilitate some of the park’s most impacted trails. 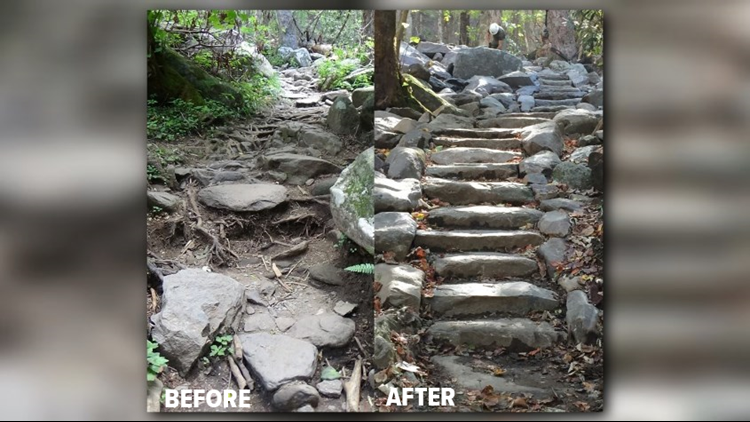 The Trails Forever program provides the opportunity for a highly skilled trail crew to focus reconstruction efforts on high use and high priority trails in the park including Rainbow Falls Trail and the recently restored Alum Cave, Chimney Tops, and Forney Ridge Trails along with other projects across the park.